I forgot to post about this news from a few weeks back. The Milwaukee Journal-Sentinel archives are now back online at Google News Archive. They had gone offline in 2016 due to the owner of the newspaper changing. They have now put up an article saying that they are back online for now as they work with a new vendor. They said that people have been asking for them. The Milwaukee Journal Sentinel’s Google News historic archives are once again available for public viewing. These archives include Milwaukee Journal print editions going back to 1884, Milwaukee Sentinel papers going back to 1910 and Journal Sentinel dailies from 1995 through 2007. This also means that I can continue adding to my Milwaukee Death Index project. 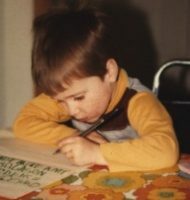 It had to be put on hold as I was getting all of my data from these newspaper archives. I hope to begin transcribing new entries pretty soon. Currently, there are over 2000 entries already added, so take a look. 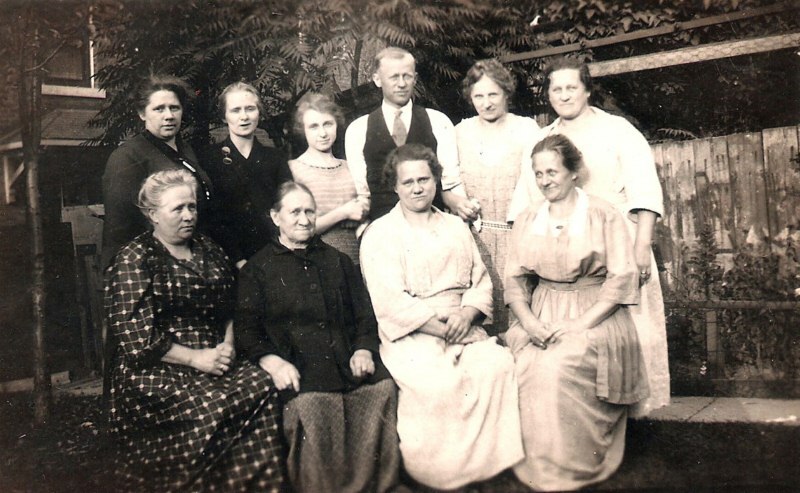 The fifth ancestor in my 52 Ancestors in 52 Weeks is my 3rd-great-grandmother, Nepomucena (Ne-po-moo-see-nah) Susanna (SYLDATK) SZULTA. I am related to her via my father → his father (Richard ZALEWSKI) → his mother (Emily TROKA) → her mother (Clara SZULTA) → her mother (Nepomucena SYLDATK). Based on records, she was normally known as “Annie.” According to a few name definition websites, her name is derived from the name Nepomuk. It was usually given in honor of the medieval saint John of Nepomuk (c. 1345-1393). There is some confusion as to what exactly the name means outside of the saint. All in all, there is some uncertainty and ambiguity surrounding the etymology of Nepomuk. The only thing that we can truly say for certain, is that the name is of Czech (and therefore Slavic) origin. Some sources claim that Nepomuk literally means “from Pomuk” or “born in Pomuk” in Czech, but this is probably incorrect, as “from” is z in Czech and “born” is narozený in Czech. Instead, Nepomuk probably literally means “not Pomuk” in Czech, derived from ne meaning “not” or “no” and Pomuk meaning “Pomuk”. The SYLDATK surname roughly translates to “woman soldier” in Russian. According to the church records of the area, she was born on 7 August 1853 in what is now Gowidlino, Sierakowice, Kartuzy County, Pomeranian Voivodeship, Kashubia, Poland. She was baptized a week later on 14 August 1853. Not much is known about her early life in the area, but on 3 February 1875, she married Ignatz Peter SZULTA (Shool-tuh) in nearby Sulęczyno Parish. Their first three children, including my great-great-grandmother, Clara, were born in the Sulęczyno area. It seems Ignatz emigrated first, spending some time in the Milwaukee area before the rest of the family, Nepomucena and her three children, arrived in November 1881. It looks like they lived on Sobieski Avenue in the highly-Polish Riverwest area of Milwaukee for the first few years. There are few details about Nepomucena’s life besides that standard records like the census. They had at least six more children born in Milwaukee for a total of nine. It notes that in 1910, at the age of 57, she was doing housework for another family. The photo above (on the post) is of Nepomucena and some of her descendants. She is on the bottom row, 2nd from the left. Clara, her daughter and my 2nd-great-grandmother is to the left of her and my great-grandmother and her her granddaughter, Emily TROKA, is above Clara. The only other one I know off of the top of my head is her son John, in the middle back. Three days before Christmas in 1925, Nepomucena passes away. She is buried next to her husband at Holy Cross Cemetery in Milwaukee. I’m not sure how I fell into it this past week, but I decided to jump head first into trying to find and record all of the Zalewski lines in the Milwaukee, Wisconsin area. My main reasoning is to try to figure out where my great-great-grandfather, Frank Zalewski, was born (or possibly his brother Jacob.) Another reason is to try to connect some or all of them together. That is doubtful as a lot of them come from completely different parts of Poland or Russia and Zalewski is actually somewhat common over there. This is also somewhat part of The Zalewski Project that I started. I did end up using a lot of the info over there to help figure out where to start. Currently, in my RootsMagic database that I made specifically for this project, there are 586 individuals in 227 families. I have color-coded some of the main lines to help me better separate them and so far I have 8 major lines, with 2 of them (Frank and Jacob) technically from the same line, though we don’t know their parent’s names. One line also comes from the Stevens Point area in central Wisconsin, but they do come to Milwaukee and also connect to the Jacob Zalewski line at one point, so I included them. Maybe someday I can add “Zalewski Expert, Milwaukee Area” to my genealogy resume. I’ve learned a whole bunch about the Zalewski families in the area already. I also started a subscription over at GenealogyBank to better search Milwaukee newspapers, which was very helpful. There is so much information in obituaries, wedding announcements and other random articles. I’d love to see if any Zalewski descendants in the area have purchased DNA tests. If so, hopefully they can transfer their info over to GedMatch to see if we can determine where the Zalewski DNA is hiding. If you have Zalewski connections in the Milwaukee area, give me a shout. I might have some information on it. The third “ancestor” in my 52 Ancestors in 52 Weeks project this year is (in one direction) my first cousin, twice removed, Edward John “Edy” STRELKA. I say, “in one direction” because that is how I’m related to him through my paternal grandfather. If I go through my maternal grandmother, he is my great-great-grandaunt’s husband. I ran a relationship report on Edy for myself and found the 1C2R relationship through my grandfather. I ran it again on one of his children, and I am also a first cousin, twice removed to them, though through my grandmother’s line. Genealogy can be weird sometimes when people cross the streams. My first connection to Edy is through my father → his father (Richard ZALEWSKI) → his father (Joseph ZALEWSKI) → his sister (Martha ZALEWSKI) → her son (Edy STRELKA). 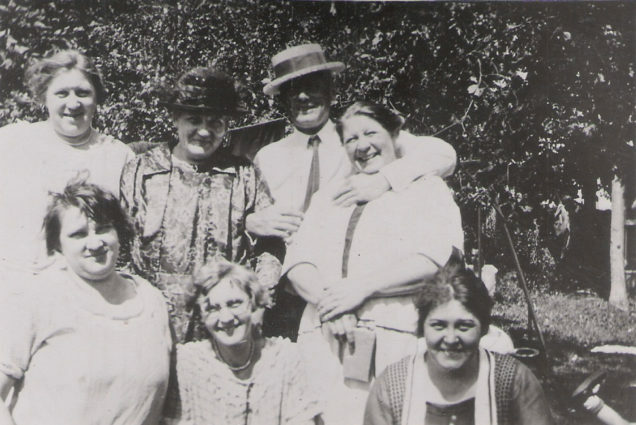 The second connection is through my father → his mother (Mary Jane CORRIGAN) → her father (Maurice CORRIGAN) → his sister (Ethel CORRIGAN) → her husband (Edy STRELKA). Edy was born 19 September 1909 in Milwaukee, Wisconsin to John & Martha (ZALEWSKI) STRELKA. Martha is my paternal great-grandfather’s older sister. Martha passed away in 1930 at the age of 45 when Edy was 21. In July 1933, Edy married Ethel CORRIGAN, my maternal great-grandfather’s sister. It is actually due to this marriage that my grandmother meets my grandfather, so in turn, partly why I exist today. Ethel was living in Milwaukee in 1930 with her mother and a few other siblings. Her mother had re-married after my great-great-grandfather died in 1915. I’m told my grandmother was down in Milwaukee working when she met my grandfather. I do actually have video of Edy, along with many of the other Corrigan family. I put it on YouTube a few years back. There is no sound, but I did put some quiet music over it. Edy was found and bookmarked in a few places, thanks to my first cousin twice removed, Jackie. You can view the video here. To view Edy’s clips, just browse to the description and click on the timestamps. It will take you there automatically. 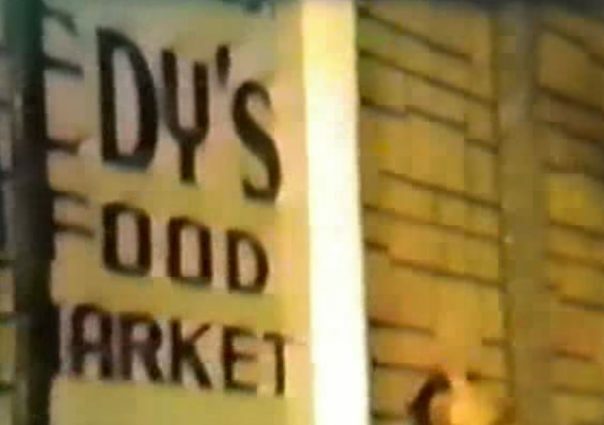 Edy ran a grocery store in Milwaukee in 1940s/1950s called “Edy’s Food Market.” I found it listed in the 1950 Milwaukee City Directory. It was the earliest year I could find it. The directories they had from the 1940s were missing a lot of pages. It was located at 2900 N 7th St. Today that location is still a food store called 7th Street Foods, though the area may be a bit different. It’s also shown a bit in the video I mentioned above and linked in the video description. Before that, in 1937, it looks like Edy worked for the Chicago and Northwestern Railway Company as a Yard Clerk according to railroad employment records. According to his obituary, he also ran a place called “Edy’s Recreation” on E. Clarke St.
Edy and Ethel had two daughters. I don’t have a lot of information on the family after the 1940s, but at some point I think they moved north to Random Lake in Sheboygan County. Edy passed away on 2 May 1990 in Milwaukee at the age of 80. They are now buried at St. Mary’s Cemetery in Random Lake. They were originally interred at Holy Cross Cemetery in Milwaukee. I know this because of the information I had and when I went to take photos a few years ago, I could not find them. The person working there told me they were moved to Random Lake. I’m not sure why. In terms of DNA, I probably share some with Edy. Though, I do not have any known connections that descend from him. Since we both came from the Zalewski family, it’s very possible. We don’t share Y-DNA, since his connection to Frank & Anna Zalewski is through his mother. 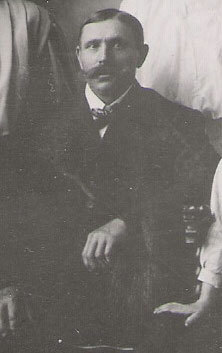 His mtDNA would be up through Anna’s line and then through her mother, Eva Sonefeld. I do have at least one known connection with the Zalewski line, though it matches one generation back before my great-great-grandparents. Doing this post does give me a few things to do. I’m going to try to contact Edy & Ethel’s daughters, or grandchildren, to see if they may have any photos of Edy’s mother Martha and beyond. My Milwaukee Death Index site is still proceeding nicely. Many more entries have been added, we now have over 1300 entries and all of 1884 and 1885 have been completed. The site itself has also been getting some updates. To make it more helpful when selecting a year to filter by, the site now shows how many entries that year has next to its selection. A lot of other work has been done under the hood to try to make the site cleaner and quicker. Also, big thanks to Lisa Louise Cooke over at the Genealogy Gems for putting up a blog post talking about the index. I’ve been a longtime listener to her podcast and I know how she likes to help the genealogy community get their info out. Hopefully the site will help other people find some useful information. I continue to add data to my Milwaukee Deaths Database, though I have also spent some time adding a few helpful features. I don’t want it to just be a list of deaths, though that is helpful in itself, I also want people to be able to use that information. Personally, I find the entries much more compelling when they’re tied to a real person, not just an entry. Now, within the details of a death entry, you can search for the individual in a few burial index sites. Currently, this includes the Archdiocese of Milwaukee Catholic Cemeteries burial index, Find-A-Grave, and BillionGraves. The search, while helpful, is not perfect. I can only search using the information included in the entry. Sometimes this does not work if they spelled the name differently in one of the places, though you can always tweak the search variables once you’re at the indexing site. If I happened to find a matching entry from one of those sites, that entry is now linked directly from the entry. The entry will be flagged with the little headstone icon you’re used to seeing on Find-A-Grave. I’m hoping to add a few more features that I think would be helpful down the road. Features like the ability for any users to submit corrections or links to burial entries from the sites listed above, more indexing sites, and better ways to search and filter the data. I plan to add a “changelog” page on the site to let people know which features/bugs were added/fixed. There are a few things I learned while looking for deaths in hundreds of old newspapers from the late 1800s, besides that it’s very hard to just scan the page for information. A lot of these things I was already well aware of, but it’s still good to know when going into it. One, these papers are just chock full of information. The Milwaukee Journal papers from the mid-1880s are only 4 pages long, but they have so much information. Once you find sections like “Wisconsin News” and “Jottings About Town” where they have dozens of small bits of information in a list, you see all kinds of neat things. Two, they knew all kinds of information about the least important people. Unlike today where most of the information in the paper is from big stories, in these you can find stories about a toddler that broke her arm or where your neighbors were visiting this week. Five, you will probably find something about someone related to your family if they lived in the area. Again, going off of #1 and #2, there are so many tidbits of info, the odds are pretty good. I have not yet come to the years when my family lived in Milwaukee, but I’m definitely going to look closer once we get to 1891-92. I hope the little bit of transcribing helps someone out there. It’s fun for me to look at the history of Milwaukee through the eyes of the papers and its citizens. 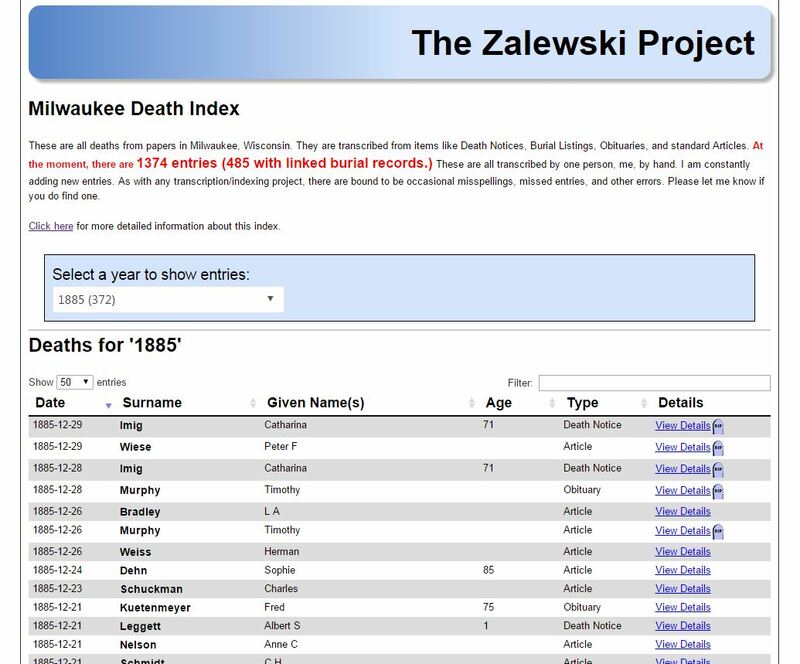 If you haven’t visited the Milwaukee Deaths database, we’re up over 920 entries now. My Milwaukee Deaths database is now live (and alive, so to speak.) You can read the details in my last post or on the database site itself. I’m still currently adding new entries when I get time, so it will keep growing. Currently, it has about 900 entries from all of 1884, early 1885, and early 1910, only from The Milwaukee Journal right now. 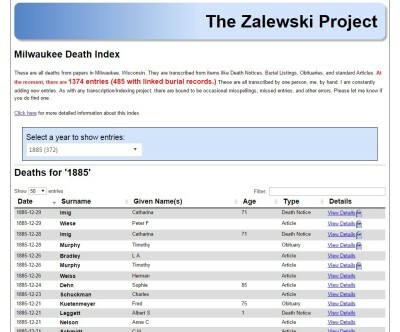 You can view the Milwaukee Deaths database on my The Zalewski Project site. Feel free to bookmark it. Over the years, I’ve spend a lot of time looking for deaths in the archive of The Milwaukee Journal on Google News. The problem is that these entries are usually too small (or too bad of quality) that they don’t get picked up by the character-recognition software when Google put them online. This means you can’t automatically search for them. Also, depending on the date of the paper, the death may be recorded in a normal obituary, a full article (like my great-great grandfather, fortunately), a tiny single-line burial permit, or a small death notice. I’ve built my transcription process to be pretty simple. It’s something I can do when I have 10-15 minutes free. I can just open an archived paper, browse through it, and fill out a small online form when I see a death. Once I hit submit, it’s already in the database and viewable online. It’s not publicly available, yet, but I hope to have it up soon. It’s not every piece of information on every death recorded in the paper. I am human and only one person. There will be items I miss or things I enter wrong, but it’s more than is out there now. The benefit is two-fold. This data will be recorded and searchable, and I will probably find information on my family somewhere. Also, who knows how long Google will keep the archives online. These papers are available elsewhere on microfilm, etc, but I’ll do what I can when I can. Keep an eye on here to see when the data will be available. I foresee in the next week, at least for basic listing and searching. This all started when, on a whim, I decided to see what happened in Milwaukee 100 years ago. I went to the Google News Archive site for The Milwaukee Journal and brought up the paper from March 19, 1915 (I know, I was one day off.) 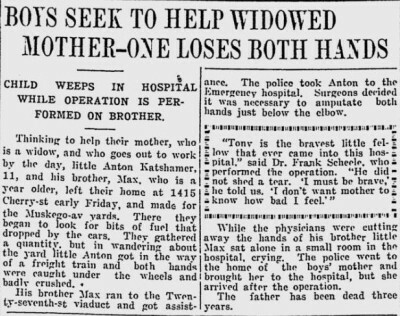 I read a few front-page stories and then ran across one titled, Boys Seek to Help Widowed Mother-One Loses Both Hands and the subtitle says, “Child Weeps in Hospital While Operation is Performed on Brother.” How could I not keep reading? If you can’t read the article, it basically talks about two boys who went off to a train yard to collect bits of fuel (probably coal) that fell off of the trains. While running between two cars, one boy had his hands crushed between them when they moved. In the end, he had to have them amputated at the elbows. I was now very interested in what happened to this boy, Anton Katshamer, as named in the story. I went directly to FamilySearch and tried looking for that name, but no luck. After playing with the names, spelling, and family members, I ran across a family in the 1910 Census for Milwaukee with all of the correct people; a boy named Max, a younger boy named Anton. Though, their last name was spelled, Kopfhammer. I then found the family in the 1920 Census. 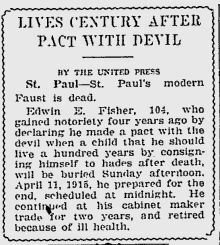 This time without a father, which lines up directly with the story that mentions “the father has been dead three years,” so in 1912. I went to our trusty friend, Google, to try to find more. 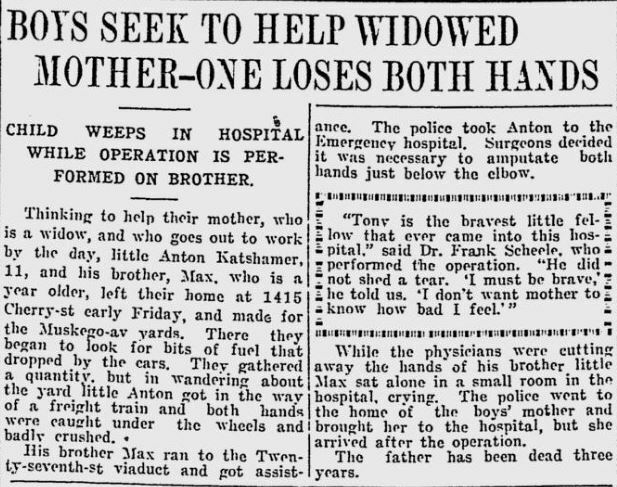 My search for Anton brought up 3 more articles from The Milwaukee Journal from later in 1915. The first one, from April 10, 1915, is titled Workers Help Fund For Tony. It mentions how a few local companies and individuals put together some money for Anton and his family, totaling $2,318 in this article, including a man who sent in his 35 cents that he saved by skipping his noon meal. The second one from later in April on the 20th, titled Guardian Named For Boy Who Lost Hands. It mainly talks about who took over Anton’s guardianship while he works on learning to live without hands, including, hopefully, getting artificial hands. The last one from December 1915 is titled Injured Boy Gets $15,000 in Court. $3,000 of that came from the local businesses and individuals and $12,000 came from the railroad company, though without involving a lawsuit. There are some funny quotes from Anton in this article. It was suggested that Tony would not be a howling success as an attorney without hands, as one of the great requisites for financial success is five flexible digits on each manual extremity. I also found a death record for an Anton Kopfhammer matching the dates from California in 1989, though no luck on obituaries or more information. I’d really like to see what he became when he grew up. I’ll keep you posted if I find anything more. It’s amazing what information you can find with the records available today. 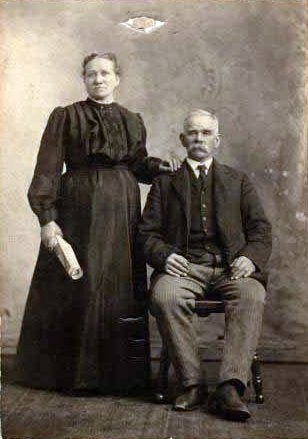 The thirty-first ancestor in my 52-week challenge is the ancestor that I’ve probably written about more than any other, my paternal great-great-grandfather, Frank J ZALEWSKI, Sr. Unfortunately, this is probably the shortest line I have. He was the inspiration for me to start a lot of my research, this blog, and my Everything I Know About websites as his was the first. Frank J ZALEWSKI, Sr was more than likely born around 4 September 1858, though I also have February 1860 as listed in the 1900 Census and 1905 Wisconsin State Census records. All other records indicate 1858. Obviously, there are many different entries for birth place as that area of the world went through many changes. I’ve mainly seen Germany and Prussia listed, so it’s possible that it was in a more German area. He married Ms. Anna LINDNER (b 27 Nov 1854) on 2 November 1884 in, what was at the time, Schwenten, West Prussia. Today, it is located at Święte, Gmina Łasin, Grudziądz County, Kuyavian-Pomeranian Voivodeship, Poland. My notes always had it listed as January 1885 in Poznan, Poland. While Poznan is sort of nearby, it’s not really that close to Święte. I imagine someone just picked the largest city in the area. The record notes that Frank was from nearby Gottschalk, which is now called Goczałki. After looking through all of the records in the Schwenten parish, I found no other mentions of the Zalewski surname. My gut tells me that Frank (and his brother Jacob) are not from the area originally. Family stories indicate that Frank may possibly be from the Russian side of Poland. It is hypothetically possible that Frank Zalewski, Sr is, indeed, born and raised in Russian Poland and, at some later point in his life, moved to the German section in which Poznan Province was located. Although traveling across political borders was difficult in 19th-century Europe, to say the least, it was not impossible. In Russian Poland, for example, all debts to the government, including military service in the czar’s army, had to be fulfilled before travel documents would be issued and borders would be crossed. Two years of active military service followed by two years in the reserve forces was required of all males when they reached their twentieth birthday. In Frank’s case, that would have accounted for the years 1878 through 1882. We know he married Anna Lindner (a German) in January 1885, which means he probably relocated from Russian-held, eastern Poland to the German-held, western area sometime between 1882 and 1884. This, of course, is only speculation but would explain the Russian “sky” ending on the surname. I’ve taken some of this into account when researching, but to no avail yet. It turns out that finding a Zalewski in Poland is almost as fun as finding a Smith in America.